NYFW is undoubtedly one of the biggest weeks in fashion. It is the time of year when the world’s top designers come together to debut their newest collection to the biggest tastemakers in the world and the public. So far, NYFW SS18 has been a thrilling affair with plenty of trending moments that exploded all over social media. Between the groundbreaking diversity that dominated this season’s runways and the nuanced innovation seen at every show, there’s a lot to reflect on from New York Fashion Week SS18. But first and foremost, we must weigh in on all of the runway trends that are just to dominate in the upcoming seasons. Here is our editor’s list of the most popular runway trends that are wearable for the everyday gal. While the theme of NYFW SS17 was certainly risqué with all of the skin that peaked out of sheer looks on the runway, this season is surely headed in a more refined direction. 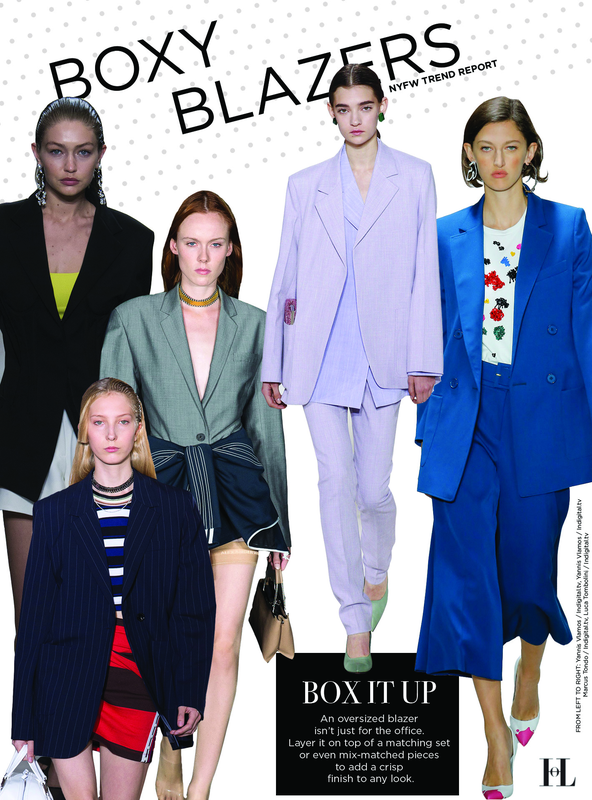 This season’s most popular coverup is a boxy, oversized blazer. No longer confined to the conference room, blazers are emerging as a closet essential for the chic fashionista who loves clean lines. The new trend appeared prominently in the runway shows of Oscar De La Renta, Phillip Lim and Derek Lam just to name a few. Blazers were used as statement pieces, often seen in bright colors and patterns or mix-matched with high-low pieces. Every it girl has been seen remixing her favorite striped button up by tying it up, wearing it off the shoulder, or even wearing it as a skirt. 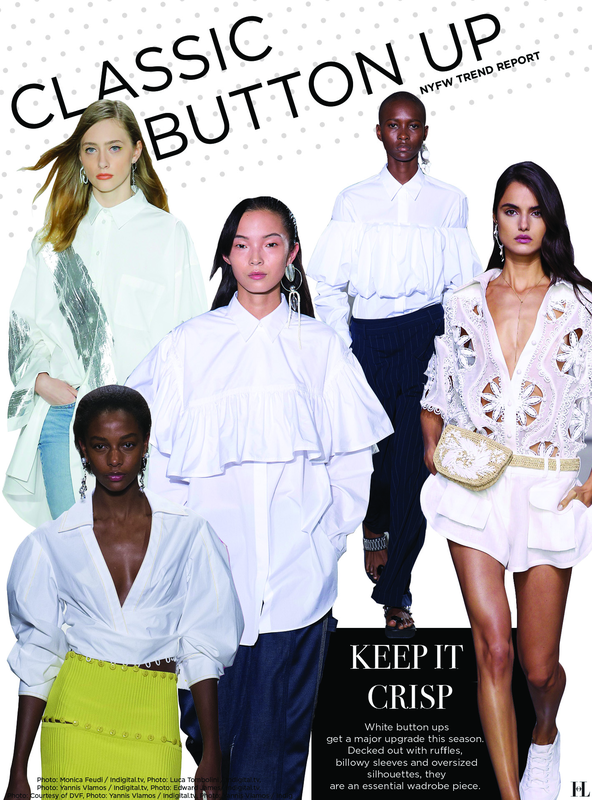 This season, the runway is bringing it back to the basics with crisp white button ups. Rather than fussing with the silhouette, the statement is in the details; whether it be embellishments, tiered ruffles or high fashion cut outs. 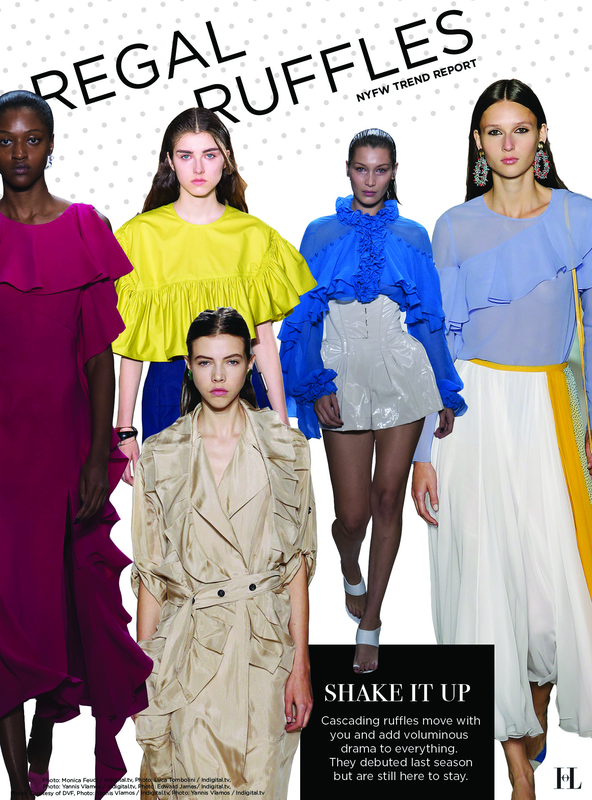 Ruffles made a big splash this Spring, and the mantra for the season’s biggest trend was certainly ‘the bigger, the better.’ This season, we continue to see ruffles in full effect, but in far smaller doses. Big puffy ruffles are switched out for cascading ruffles that compliment the silhouette rather than overwhelm it. Ruffle is mixed frequently with lighter, chiffon-like materials this season to give it a very whimsical feel. This was an especially big trend in Prabal Gurung’s collection this season. Do stripes make women look wider? This season, we’re willing to take the risk. Stripes, gingham and other bold patterns are taking a serious front seat this season. Multi-colored stripes were huge in Diane Von Furstenberg & Victoria Beckham‘s collections. 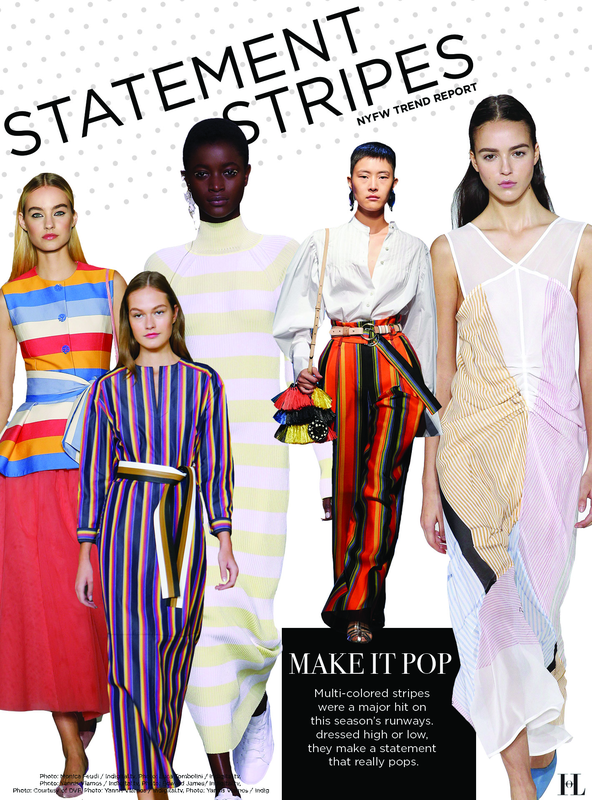 Also, don’t be afraid to mix and match stripe patterns — in fact, according to the collections of NYFW SS18, this is highly encouraged. What are some of your favorite New York Fashion Week trends?